There are haikus in today’s paper. I’m not sure if they are part of the Holiday Haiku contest that the News-Miner is running but they – plus the fact that I learned that a former co-worker is involved with the fabulous NYC DOT bike safety “Curbside Haiku” initiative – are the inspiration for today’s remix: a haiku created from the front page headlines of today’s paper. This is a really neat idea. I look forward to seeing everything you come up with! 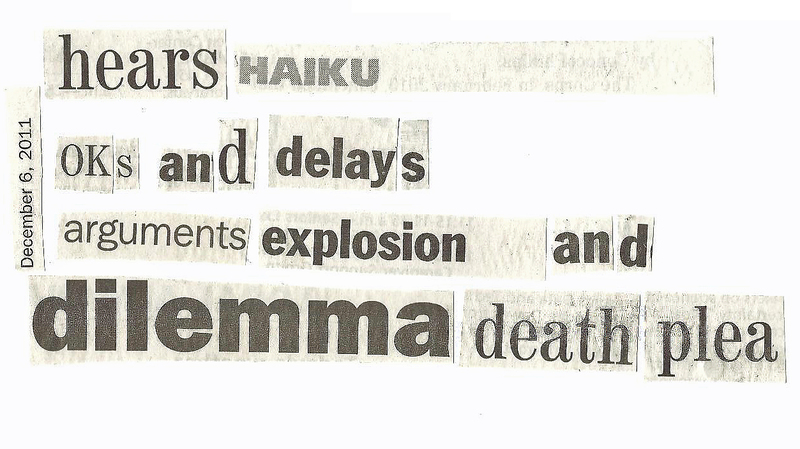 This entry was posted on December 6, 2011 by AK in 365 Days of Print, alaska, art, musings and tagged 365 days of print, alaska, art, collage, daily news miner, haiku.